Dishking releases new LP ‘1O1’ | Sonic Smash-Music! 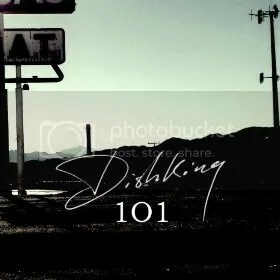 The singer and songwriter known only as Dishking has released his new LP album, “1O1.” The record contains 13 original tracks for an approximate total listening time of 40 minutes. “1O1” is the latest full-length record in a growing series of albums from Dishking including 2010’s “Sell Yourself in Gold” and 2009’s “The Power of a Loaded Gun,” both of which were published on the AG Music label. With a plain yet polished studio production and a soulful, raw overtone, “1O1” presents the best proof to date that Dishking is among Holland’s best sonic exports in decades. Dishking, who takes his name from a blue-collar job he worked to feed himself while writing music, cites as main artistic influences such titans as Johnny Cash, David Bowie, Tom Waits, Elvis Presley, Ry Cooder, T-Bone Burnett, and Daniel Lanois. His own sound takes what he likes best from each while maintaining a unique, non-derivative angle that is easy to identify. A consistent stylistic thread of Cash and Presley runs throughout, made volatile by his Bowie-esque aggression and pensive by his Waits-like, shadowy drawl. The effect of Lanois appears mostly in Dishking’s attention to studio precision and crispness of timbre. Perhaps his strongest trait of all, though, is his knack for narrative songwriting in the tradition of the American South, which is akin to his penchant for Cooder and Burnett. The title of the LP is therefore not “One-Zero-One” like the first class in a college course, as the record is sometimes listed online, but rather, “1O1” (One-On-One). “1O1” by Dishking is available online worldwide. Get in early. This entry was tagged 101, 1o1, dishking.